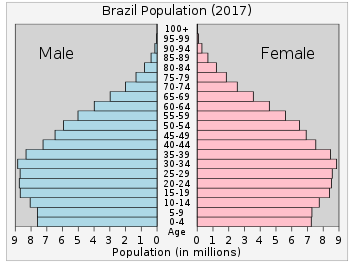 Demographic statistics according to the CIA World Factbook, unless otherwise indicated. This article incorporates text from this source, which is in the public domain. To stimulate the immigration to Brazil, the king offered several benefits for the Azorean couples. Between 1748 and 1756, six thousand Portuguese from the Azores moved to the coast of Santa Catarina. They were mainly newly married who were seeking a better life. At that time, the Azores were one of the poorest regions of Portugal. They established themselves mainly in the Santa Catarina Island, nowadays the region of Florianópolis. Later, some couples moved to Rio Grande do Sul, where they established Porto Alegre, the capital. The Azoreans lived on fishing and agriculture, especially flour. They composed over half of Rio Grande do Sul and Santa Catarina's population in the late 18th century. The state of Paraná was settled by colonists from São Paulo due to their proximity (Paraná was part of São Paulo until the mid-19th century). ^ "Brazil - Modern-Day Community". Jewishvirtuallibrary.org/. 2013. Retrieved 2013-12-22. 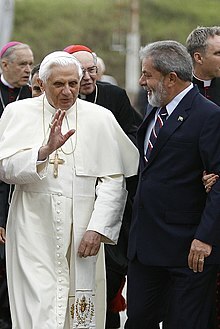 ^ "Brazil - International Religious Freedom Report 2009". State.gov/. 2009-10-26. Retrieved 2013-12-22. ^ "Research Professor, A.C. Van Raalte Institute, Hope College, Holland, Michigan, USA". Twelfth International Economic History Conference, Madrid, Spain, August 28, 1998 (Session C-31). Retrieved 2016-05-04. ^ "Entrada de estrangeiros no Brasil". Scielo.br. Retrieved 2014-01-23. ^ "São Paulo capital, uma cidade italiana e os misteres profissionais dos imigrantes italianos". Brasil500anos.ibge.gov.br. Retrieved 2016-04-11. ^ De Assis Poiares, L.; De Sá Osorio, P.; Spanhol, F. A.; Coltre, S. C.; Rodenbusch, R.; Gusmão, L.; Largura, A.; Sandrini, F.; Da Silva, C. M. (Feb 2010). "Allele frequencies of 15 STRs in a representative sample of the Brazilian population". Forensic Sci Int Genet. 4 (2): e61–3. doi:10.1016/j.fsigen.2009.05.006. PMID 20129458.